I was just killing time today when I found the most spectacular ghost town. It's futuristic symetry juxtaposed with it's haunting emptiness makes it high on my list of places I would some day like to visit. It is located in Northern Taiwan and is called San Zhi. 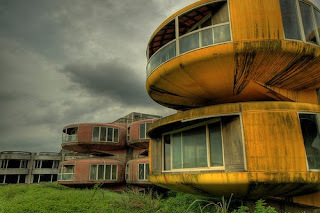 It has been called San Zhi UFO town and San Zhi Space Town and it is one of the most bizarre ghost towns in the world. It was built to be a futuristic resort, where guests could escape life in space age luxury. It was built to be a retreat for the very rich. Unfortunately, the resort was cursed from the beginning. There were numerous construction accidents and fatalities. These fatalities combined with rising cost due to the numerous accidents lead to a complete end to all construction. The incomplete resort has been left abadoned. It sits empty like a ghost town from an alien landscape. There are numerous rumors that this ghost town is haunted. The stories say that the deaths were due to a curse brough on by the bisecting of a sacred dragon statue. Other stories say that the site used to be a Dutch burial ground and the dead rose up to curse the new construction. The government was involved in the initiation of this resort and has acted to cover up all that were involved so no architects are known. Growing rumors of ghosts and curses have made it extremely unlikely that construction will ever begin again. So for now, San Zhi is left to the lonely spirits that wander its strange landscape. this one gives me the creeps--it just looks forbidding in a very malevolent way. perhaps because its so modern..I don't know but I don't think I would venture in there. A big old mansion or castle seems much more welcoming! I never heard of this abandoned Jetson's type place. It's too bad it never had the chance to see if it could have been a booming resort vacation spot. The saucer like buildings are very creepy just sitting there abandoned. It is almost like a bunch of UFO's landed there and the occupants are roaming around somewhere. This place looks wicked! I'd love to go and take some photos there. I'm with you Durkin. I would love to go there!